Positive Coaching Alliance sees the relationships developed through basketball as the game’s greatest reward. Teammates often bond for life. Scores are forgotten, but friendships are not. Coaches and players should do all they can to cultivate great relationships with each other, to place the highest possible value on coming together in pursuit of common goals. That’s not to say there won’t be differences; the healthiest families have their fair share of those. But when all is said and done, coaches and players should love each other. As their paths separate and then come back together throughout the rest of their lives, there can always be a bond, a smile and some of the best memories of their lives. Have the players get a ball and utilize as many backboards as possible (partner up if needed). The players will stand a short distance from the basket to the side of the rim and will shoot the ball at the backboard. The goal of this drill is to shoot the ball high and have the ball touch the backboard on the way down. The players will do this for the allotted amount of reps. This drill works on arc and touch as the players work on perfecting their shot. Timing is an important part of the game, for this drill the guards will partner up with a ball and find space on the court and the bigs will partner up with a ball and go to the blocks. The guards will have one dribbler and 1 defender and the defender will try to get a feel for timing the offensive players dribble and time it so that when the ball is going down leaving the offensive players hand, they can go for a steal. The bigs will allow the offensive player to dribble and bump against them for 1 or 2 dribbles to get a feel for the offensive players timing before “pulling the chair” by moving backwards away from the offensive player as they try to bump them. This often causes the offensive player to lose lose balance and lose control of the ball or travel. Take turns with the partner until they have executed the allotted number of attempts. Start with two lines on the baseline and a player on each wing.The first players in line on the baseline will pass the ball to the players on the wing and then close out to defend the offensive player. The offensive player can make 2 dribbles wherever they would like and the defender most defend them trying to prevent a middle drive. After the two dribbles, the offensive player will pick up the ball and the defender will pressure the ball before rotating. The defender will become the offensive player on the wing and a new defender will step on from the baseline. Many teams want to prevent the offense from getting to the middle. Work on this concept with good closeouts. 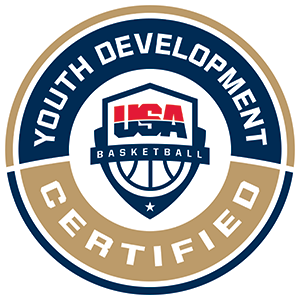 Teach the players how to dig in the post by playing both the player on the wing while jabbing and faking down into the post to disrupt the post player. The players should do this with their body facing the court with long arms to dig with one hand and the other hand to attempt to get deflections. Have the players get in a line on the wing with the coach on the same side block. The first player in line will turn and defend the next player. The offensive player will make a post entry pass to the coach. The defensive player will then work on digging down to make the coach pass the ball back out. The players will repeat this process for 3 reps and then rotate so that the defender goes to the back of the line and the offensive player becomes the defender and the next person in line becomes the offensive player on the wing. Continue through this process until all the players have done the activity. Utilize the other wing or other space to maximize reps. There are a variety of ways to defend post players and coaches may choose to adjust their defense depending on the team or the player. Regardless, you always want to keep the offensive player away from the basket, so the more difficult you can make it for the player to get close and catch close to the basket, the better. Next, the defense will depend on where the ball is. For this example, if the ball is on the wing on the same side as the post, there are the options of fronting the post by getting between the passer and the post player. You can also play behind the post player and stay between the player and the basket. Or you could choose to defend in between with something like a 3/4 or 1/2 front in which one foot is in front of the player with a hand discouraging the pass, and one foot behind the player so the defense can easily get back behind the player on the catch. There are also options of defending from the high side or the baseline side. Of course, there are different ways to double team as well. Maybe doubling from the passers defender works for you, or perhaps doubling from the weak side from the baseline side is what you like. Or maybe you’ll prefer always doubling from the other post player, or maybe you like waiting until the player dribbles to double team. The point is, there are a lot of options and we encourage you to explore what works best for you. Divide the players into teams of 3 and have one group on offense, another on defense and any additional groups behind the offensive team. The offense will have a player at the top of the key starting with the ball, a player on the post and a player on the same side wing. The possession will start with the wing player getting open for the pass and then making a post entry pass (all passes are live and can be stolen). 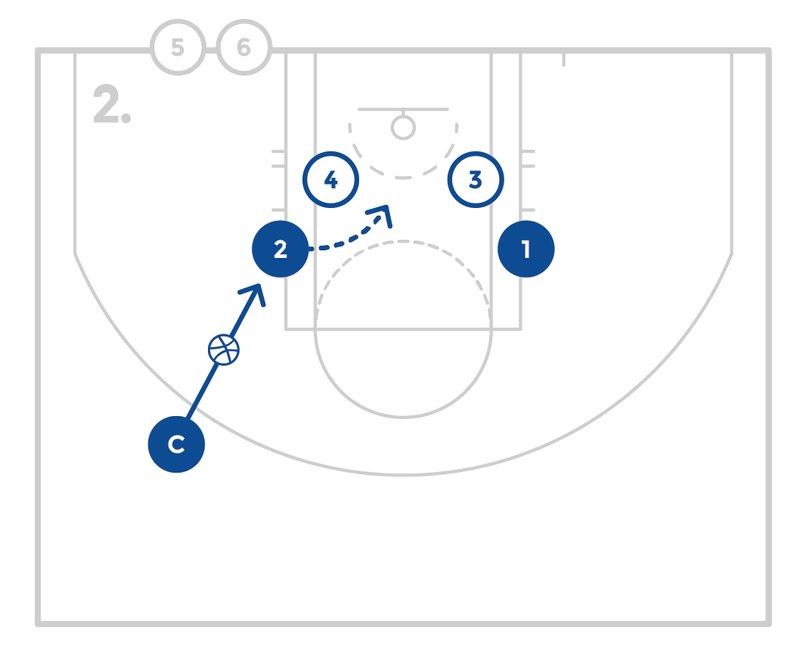 After the pass to the post the guards can cut, screen, relocate as the ball is live but should primarily try to stay on the same side of the court. The defensive player can work on digging in the post when appropriate. Divide the players into teams and provide a specific game situation. Game situations may be, giving a team the ball and telling them they are winning by 1 point with the ball with 45 seconds remaining. Another game situation may be, losing by 2 with the ball and 2:30 left in the game. Help the players understand game and clock management and reinforce key points that come up in the situational play. Around the World Plus (makes plus half court!) (1 game). Place five cones around the court as five shooting spots and divide the players evenly and have a team start in each corner spot. The players will shoot from that spot until the team makes 6 shots. After the 6 makes, teams will rotate to the next spot and repeat until they have made all 6 from every spot. After the last spot, the team will have to make 1 half court shot! Around the World – Makes! The players will shoot until their team has made 5 shots from that specific spot. After the team makes 5 shots, the group will rotate to the next spot and repeat until each team has shot at all five spots. After a team has made 5 shots from all 5 spots, they will then have to make a half court shot to finish!